Jack Roosevelt "Jackie" Robinson (January 31, 1919 – October 24, 1972) became the first African-American major league baseball player of the modern era in 1947. 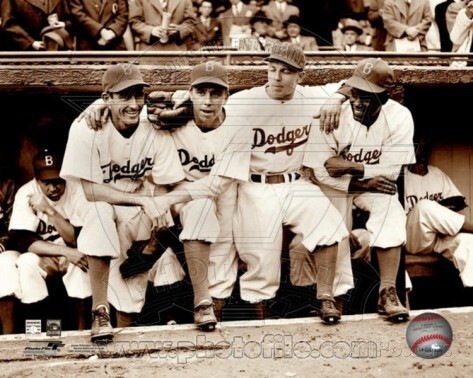 While not the first African American professional baseball player in United States history, his Major League debut with the Brooklyn Dodgers ended approximately eighty years of baseball segregation, also known as the baseball color line. In the United States at this time, many white people believed that blacks and whites should be segregated or kept apart in many phases of life, including sport and daily life. Jackie was a second baseman, but with Eddie Stanky entrenched at that position for the Dodgers, he played his initial major league season as a first baseman. The Baseball Hall of Fame inducted Robinson in 1962 and he was a member of six World Series teams. He earned six consecutive All-Star Game nominations and won several awards during his career. In 1947, Robinson won The Sporting News Rookie of the Year Award and the first Rookie of the Year Award. Two years later, he was awarded the National League MVP Award. In addition to his accomplishments on the field, Jackie Robinson was also a forerunner of the Civil Rights Movement. He was a key figure in the establishment and growth of the Freedom Bank, an African-American owned and controlled entity, in the 1960s. He also wrote a syndicated newspaper column for a number of years, in which he was an outspoken supporter of Martin Luther King Jr. and Malcolm X.
Robinson engaged in political campaigning for a number of politicians, including the Democrat Hubert Humphrey and the Republicans Richard Nixon and Barry Goldwater. Here are the stats for Jackie's 1949 Most Valuable Player season. For his career stats, click here. 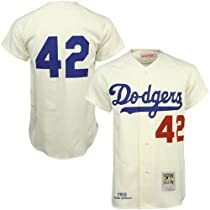 Featured here are Jackie Robinson posters, photos, giant collectibles and apparel.